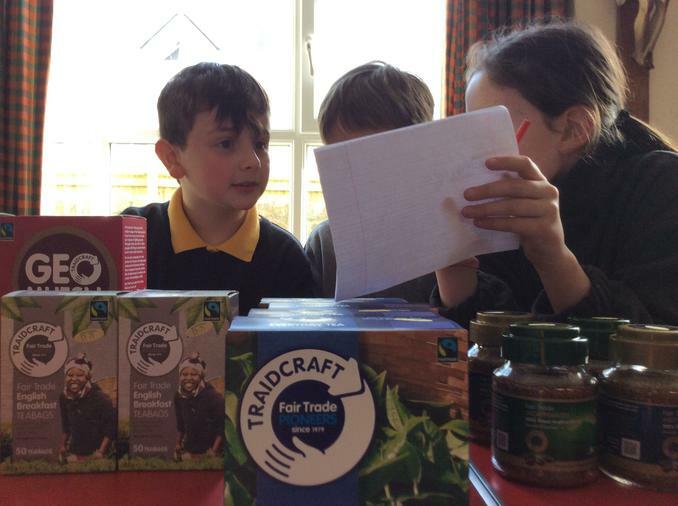 This week we went to the CO-OP to find out about all the different fair trade products that you can find at the supermarket. 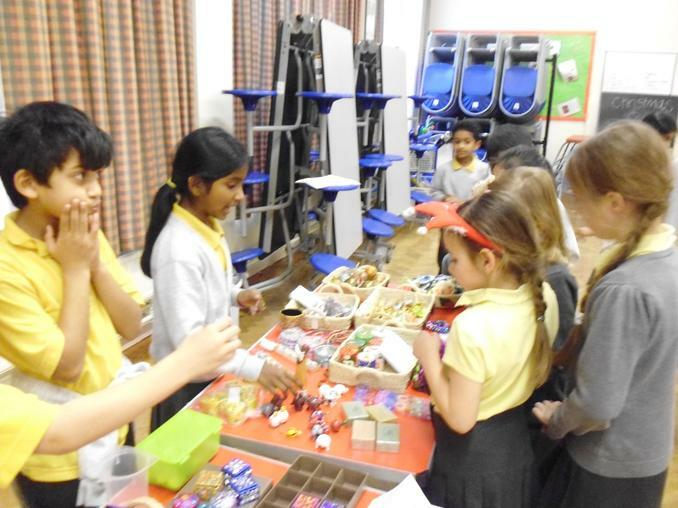 We hope to tell you all about what we found out next week during our Fair trade afternoon. 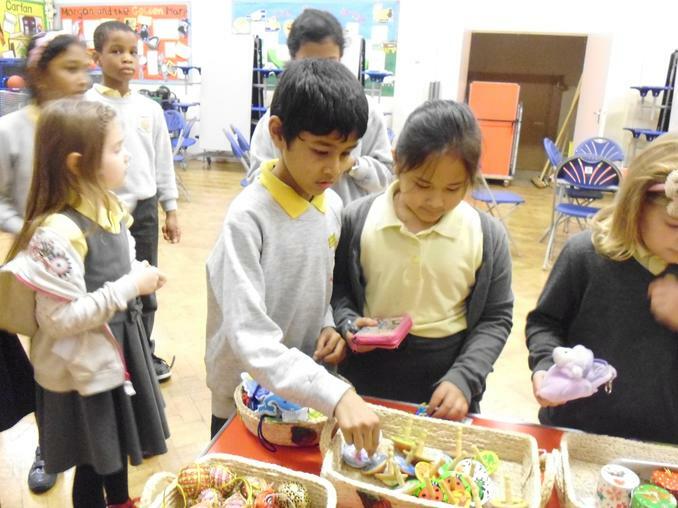 We were very surprised to find that you can buy fair trade cotton wool and roses. 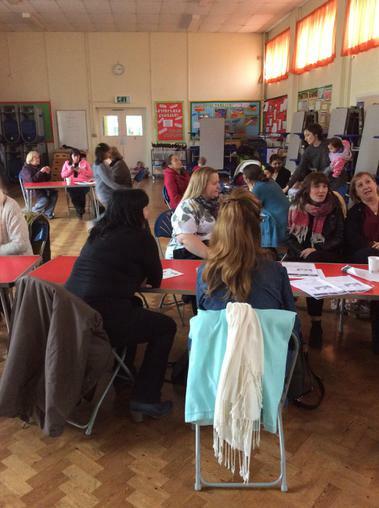 We hope that you are able to join us on Tuesday 2nd April at 2 pm in the school hall. 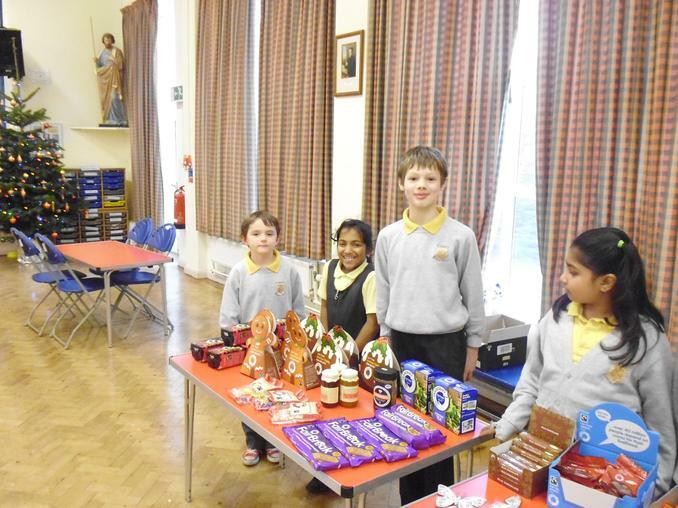 There will be many Fairtrade items on sale. 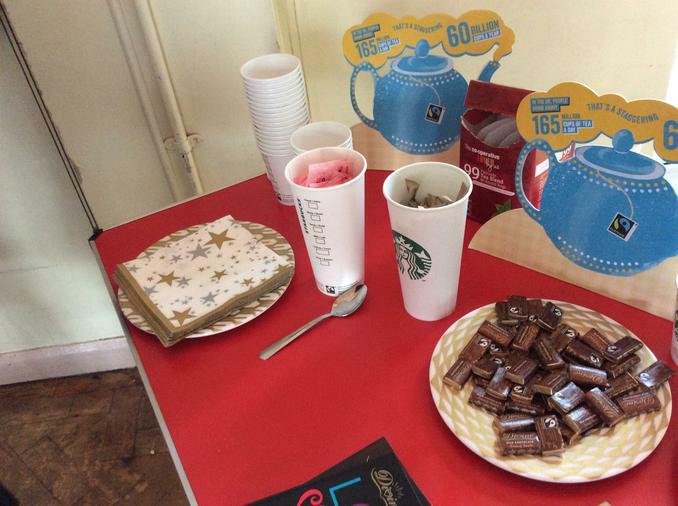 There will also be fairtrade tea, coffee and biscuits available. 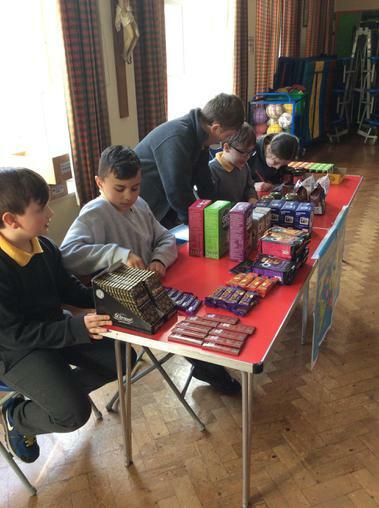 On Monday 12th March we had a brilliant Fairtrade day! 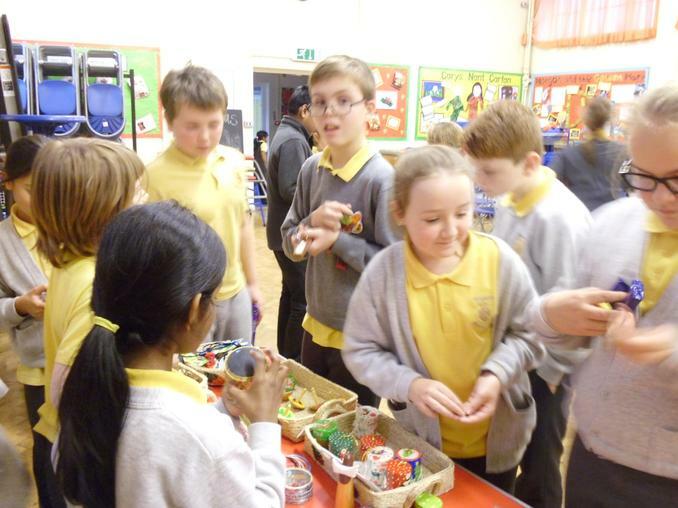 It started with an Assembly for the whole school by Aled from the FairDo's Fairtrade shop in Canton. 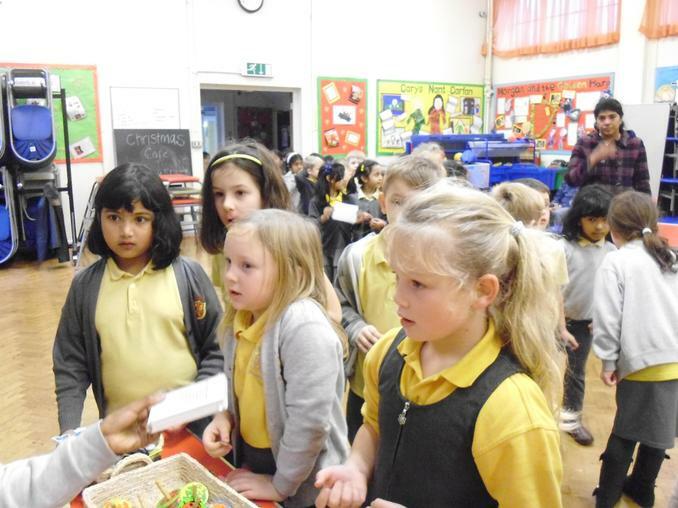 We heard lots of interesting things about how Fairtrade helps people in other countries and how farmers can get a good wage. 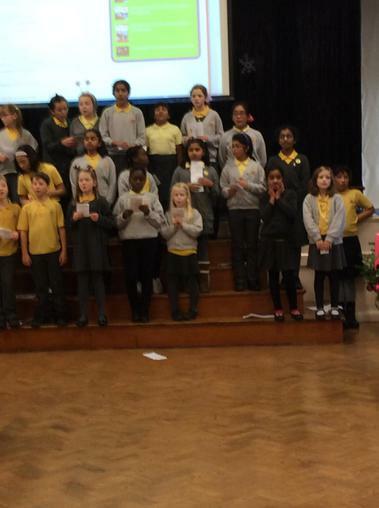 After that, Year 3,4, and 5 had workshops with Aled. 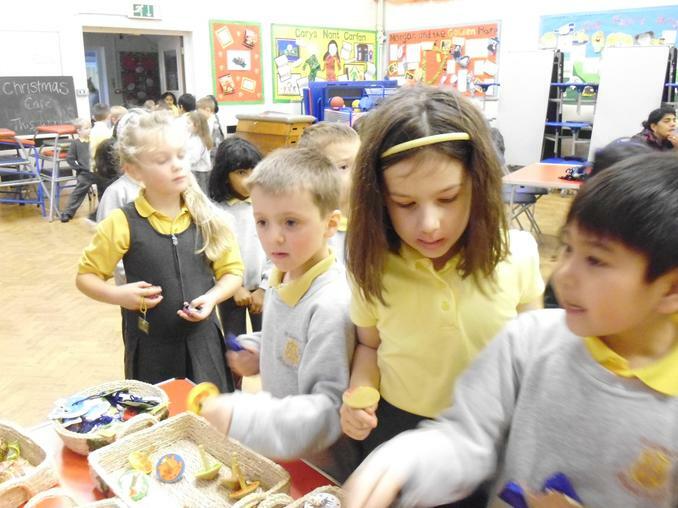 We had great fun learning about Fairtrade and really learnt new things! 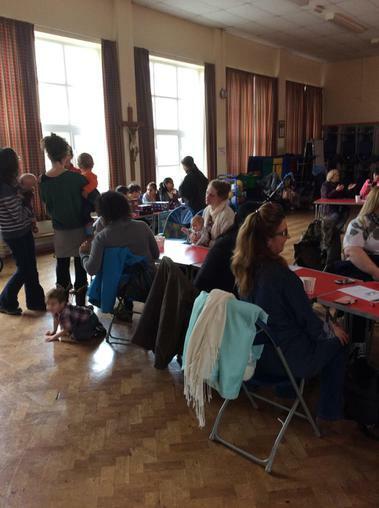 In the afternoon, we then set up the hall for our coffee afternoon for parents with the motto, 'Come on in!' 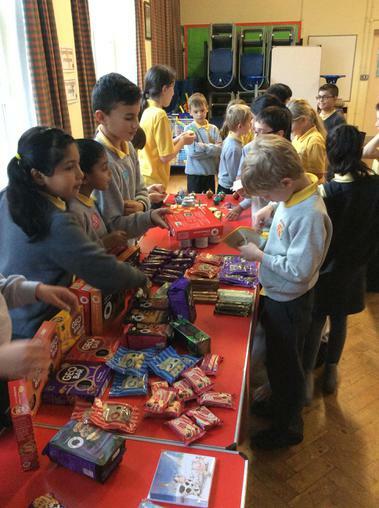 We had lots of generous donations from lots of Fairtrade companies such as: the Tropical food company, Chocolate and Love, Plamil, The raw chocolate company. 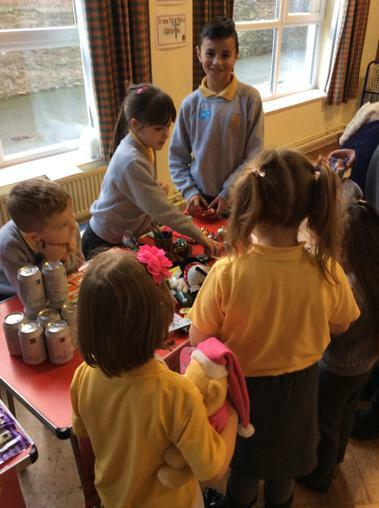 Aled also brought in goods from the Fairdo's shop as well! 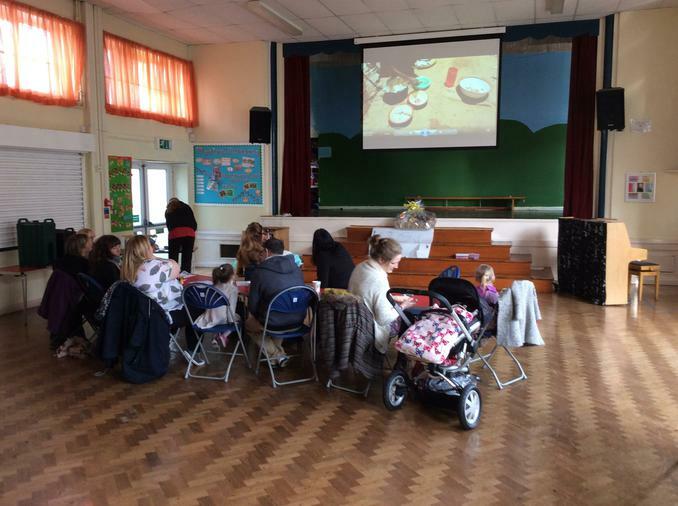 The parents all loved having their Fairtrade tea and coffee and a chat, whilst also able to look at Fairtrade products and we told the parents a bit about Fairtrade and handed out leaflets and stickers to raise awareness. 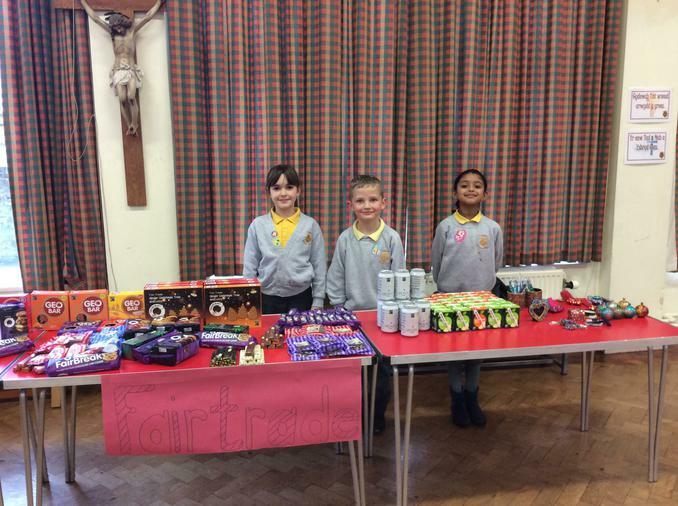 We made approximately £200 for the FairDo's shop, and £60 towards Fairtrade in our School. 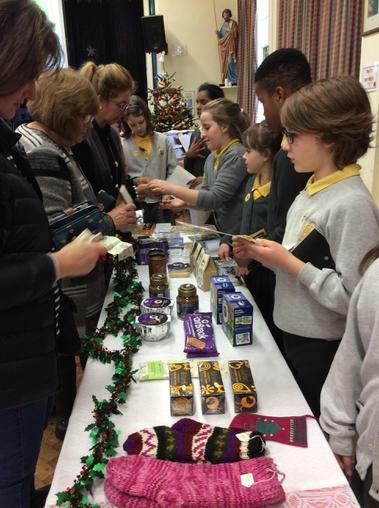 A big thank you to everyone who helped make our Fairtrade day a huge success! 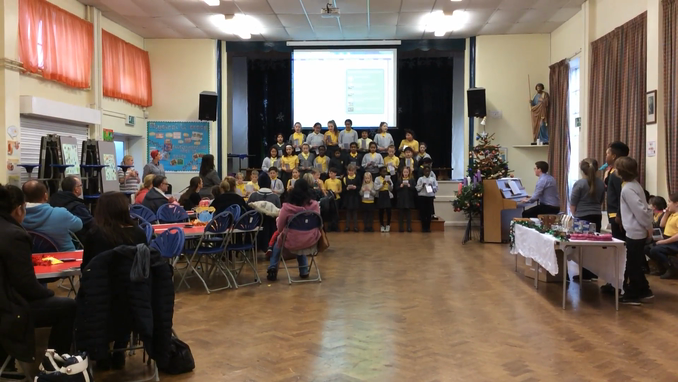 Everyone had a wonderful time, the children all sang beautifully and the Christmas songs were amazing - it really got us in the Christmas Spirit! 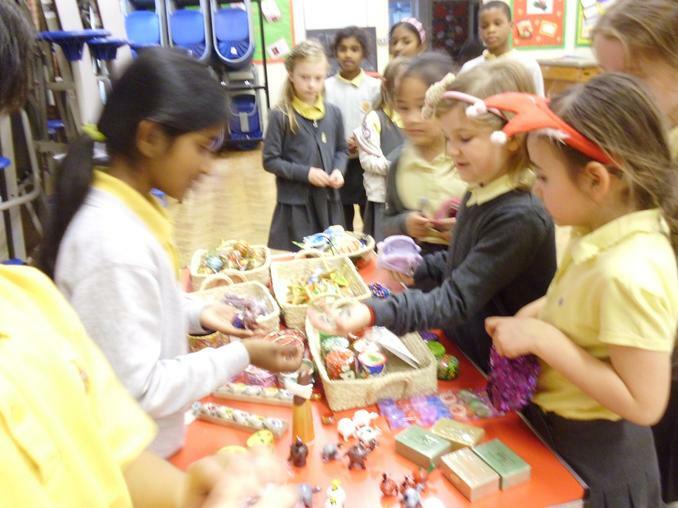 On the Fair trade stall we made £145 for the Fairtrade shop, Fair Do's in Canton. 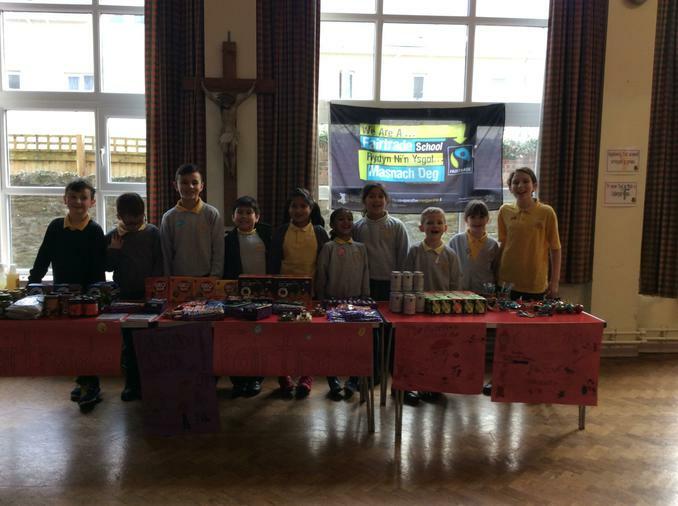 We are really happy to be able to have made this money for them! 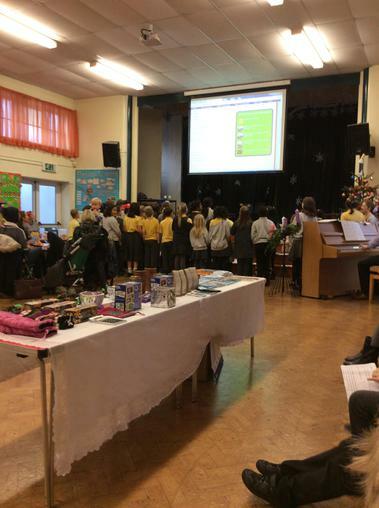 On top of that, through voluntary donations and participation in our Fairtrade raffle to win a Fairtrade mug and tea towel, we were able to raise £50 towards Fairtrade ventures within school! 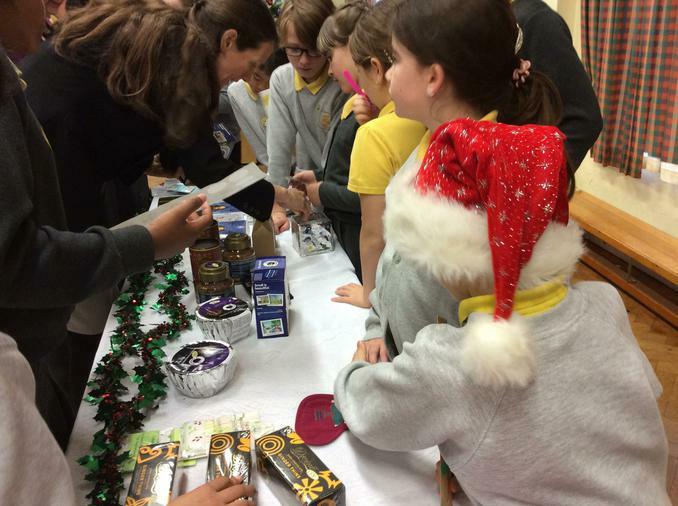 Thank you so much for all your kindness and help towards raising awareness about Fairtrade in the world! 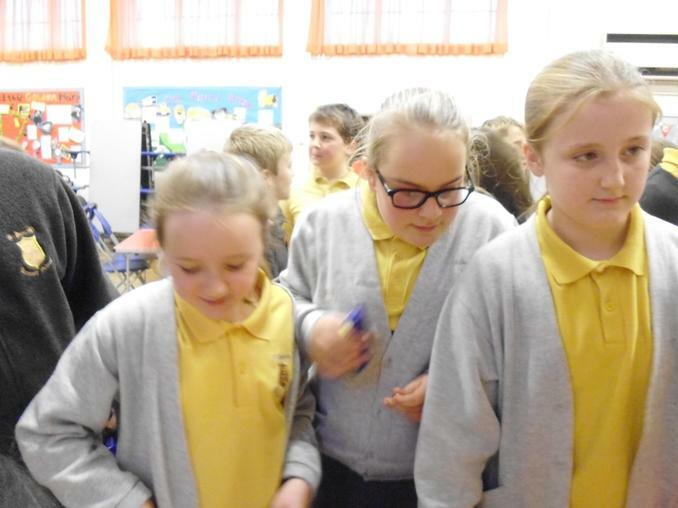 We have submitted our renewal for the Fairachiever Award and will find out the result in 8 weeks – fingers crossed – will keep you all posted. 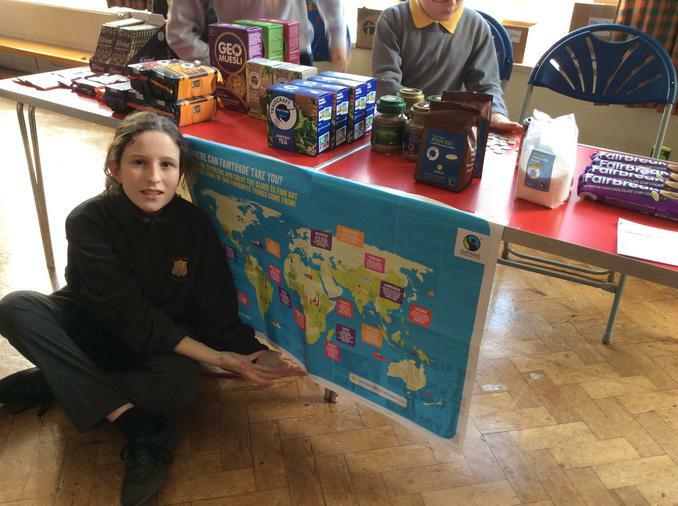 Fairtrade Fortnight is coming up straight after half term, beginning Tuesday 28th February 2017. 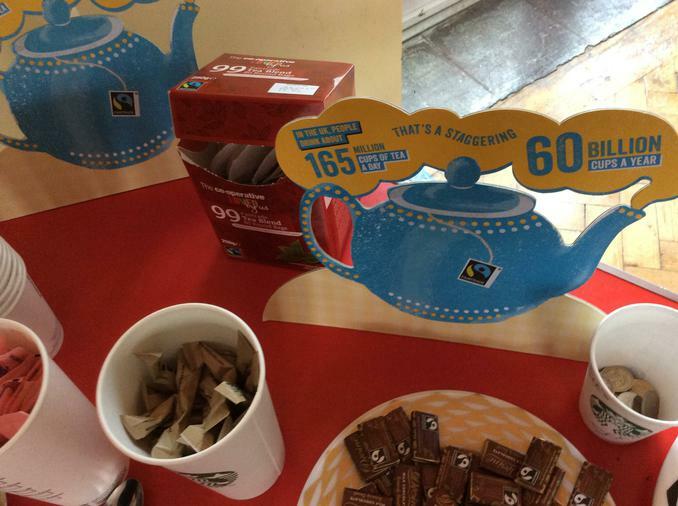 This year it’s “Put Fairtrade in your Break”. 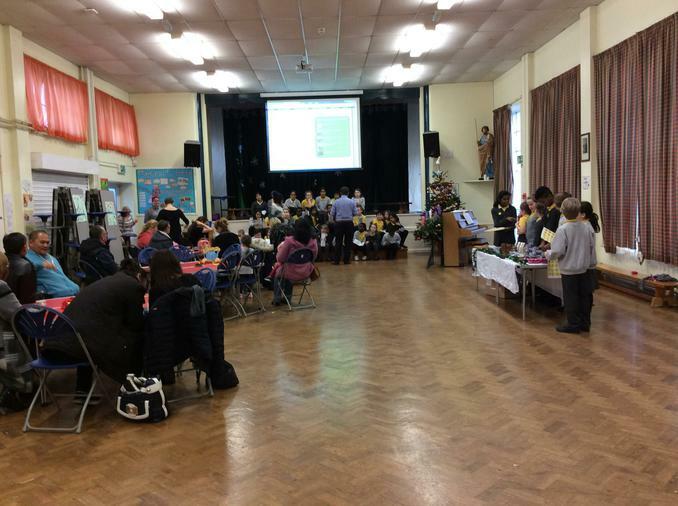 We will be holding a “Fairtrade Bake Off” for all you budding Mary Berry or Paul Hollywood who wish to take part – so get baking and remember only to use Fairtrade ingredients. 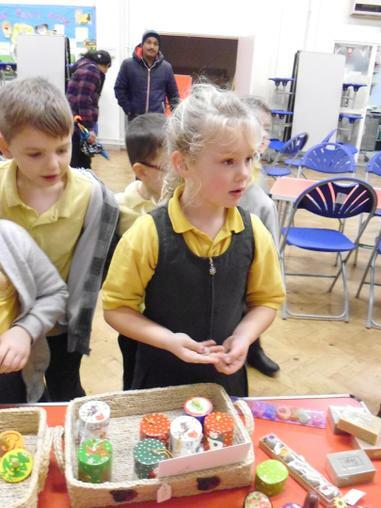 You can then bring all your creations (cakes, cupcakes etc) to our Fairtrade Afternoon which will be held in our school hall on Friday 10th March at 2pm. 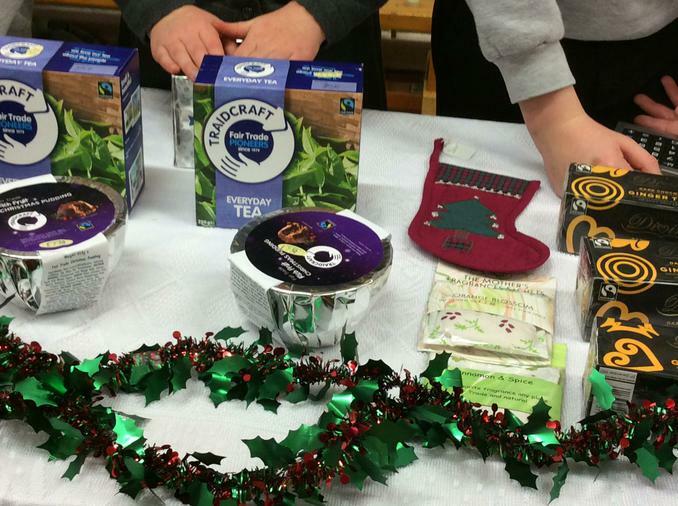 During the afternoon we will also be holding a quiz and be serving fairtrade tea and coffee. 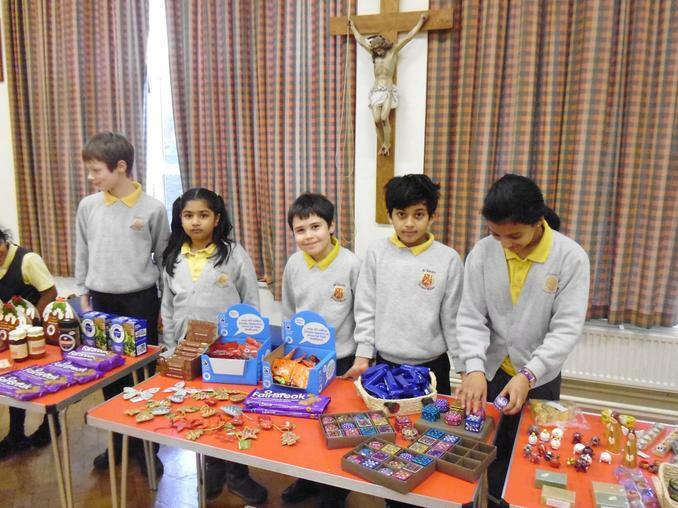 Welcome to our Fairtrade page. 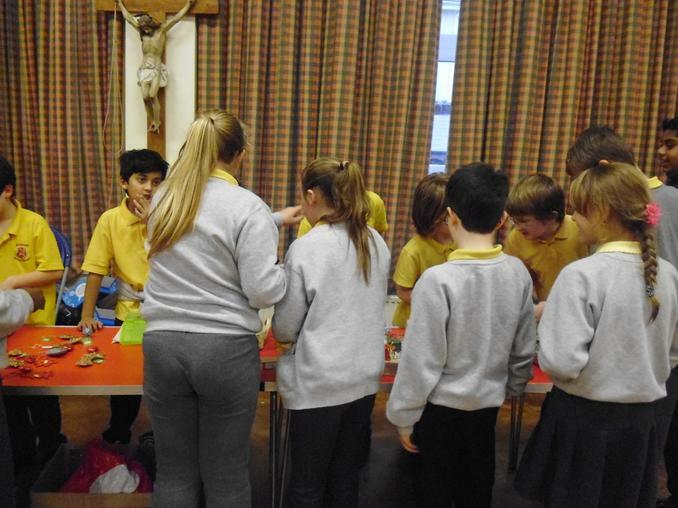 A big thank you to everyone who came along and supported our Fairtrade afternoon! 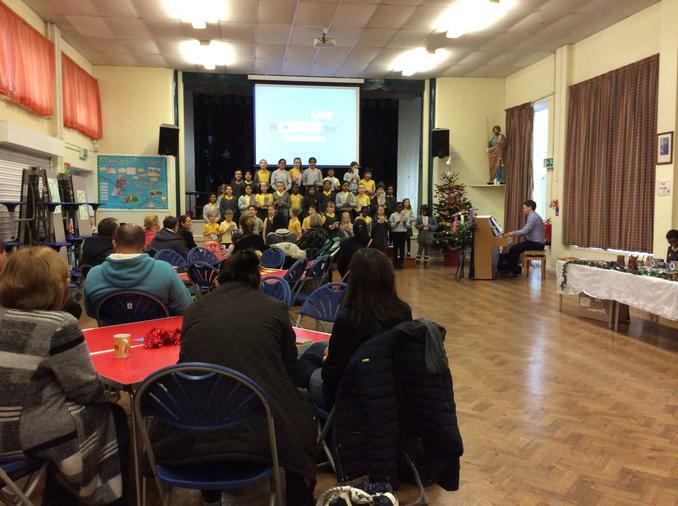 We would also like to thank the Co-op, Tesco, Divine Chocolate and Starbucks for all their generous donations to make the afternoon a success. 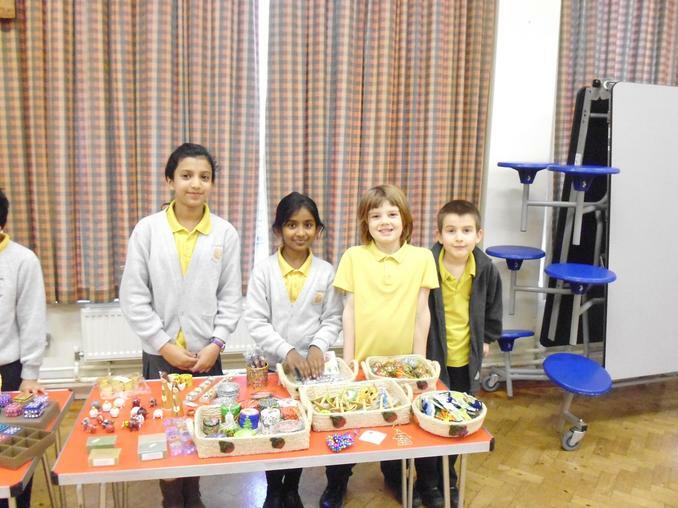 Well done to the Fairtrade Committee who raised £100! 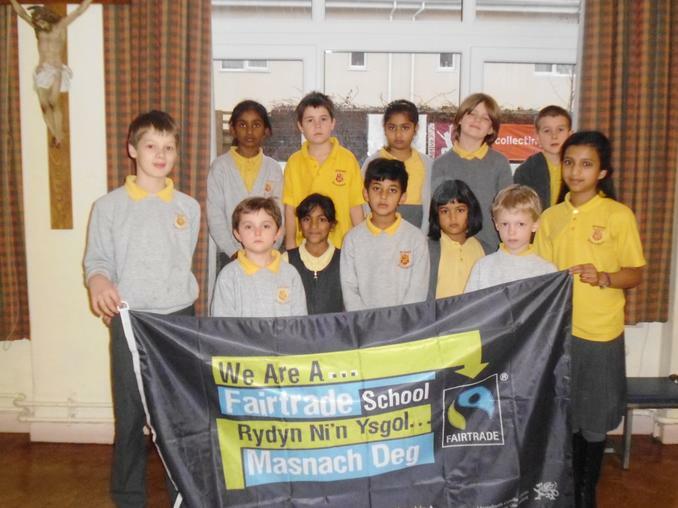 This year we will be celebrating Fairtrade Fortnight. 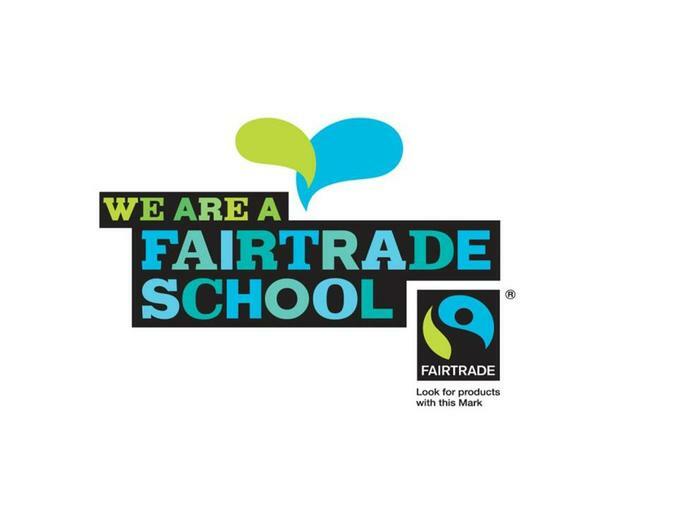 The Fairtrade Committee have been busy organising a special assembly and event for when we return back to school after the half term break. 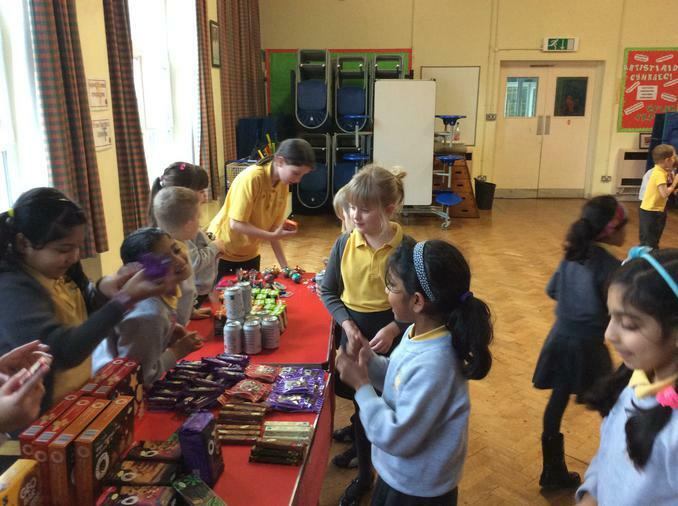 The Fairtrade Committee would like to hold our annual Fairtrade raffle. 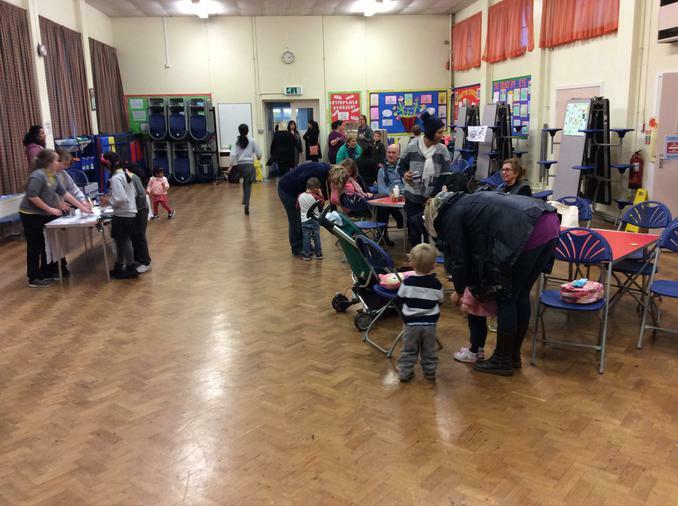 This was very successful last year and we raised over £ 100. 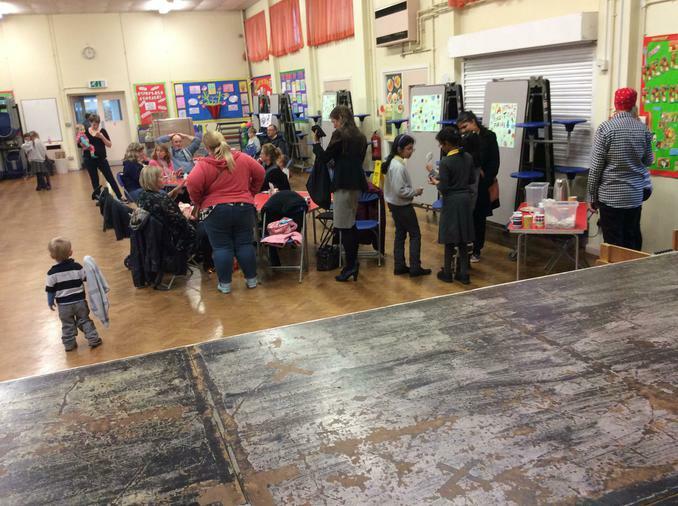 However we need your help. 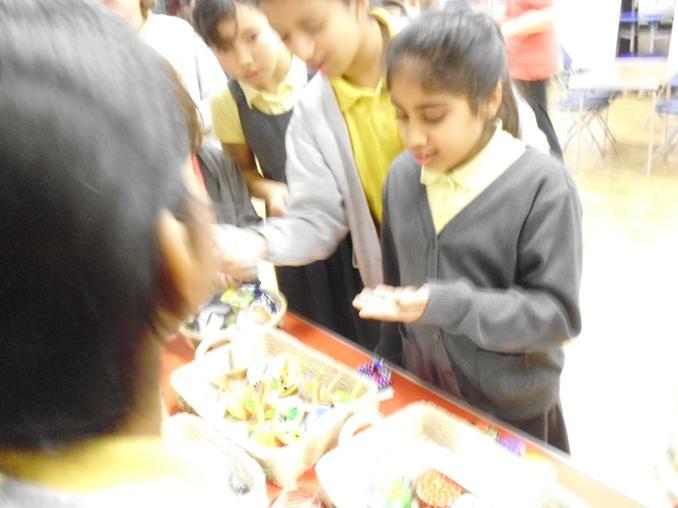 Please can you donate just one Fairtrade product so that the fairtrade committee can make up a large hamper. 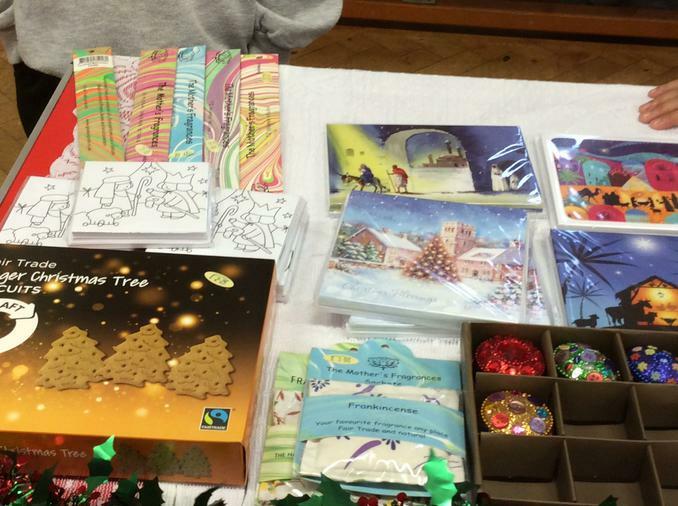 Products include a range of fairtrade chocolate, Coffee, tea bags, biscuits. 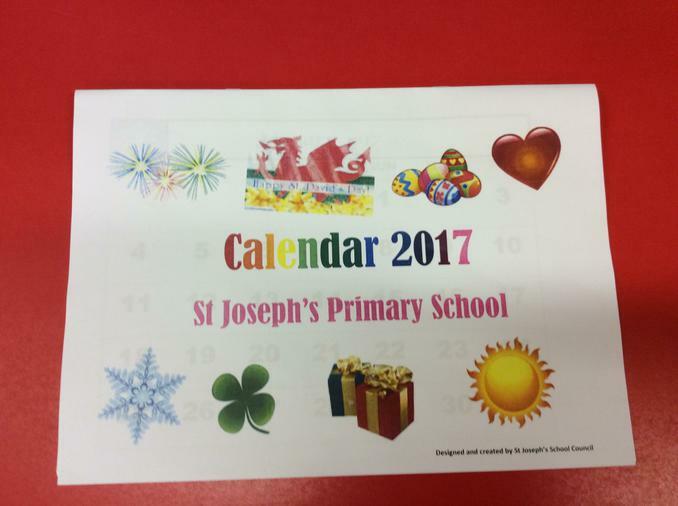 Please bring your donation to school the week beginning 22nd February. 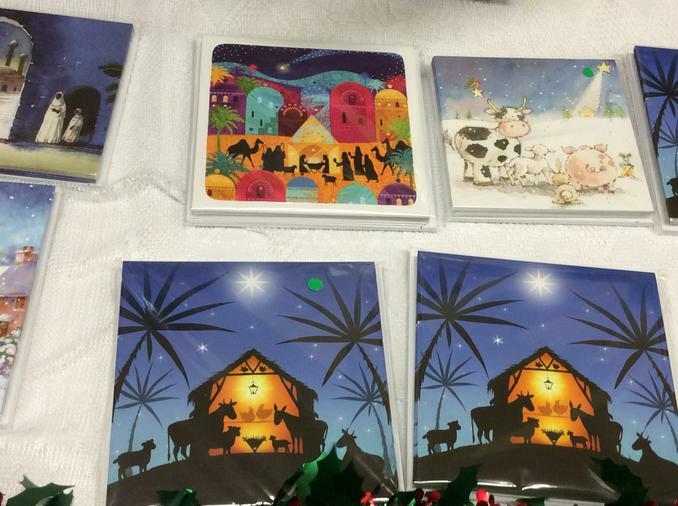 Raffle tickets will also be sold on Monday. 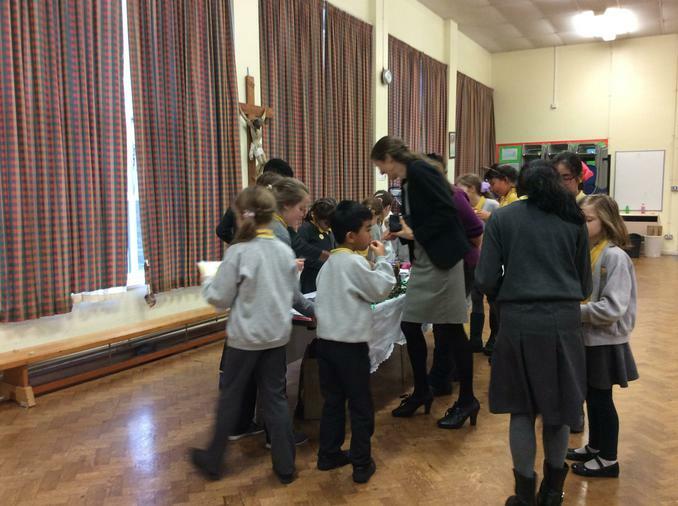 Tickets will cost 20p each. 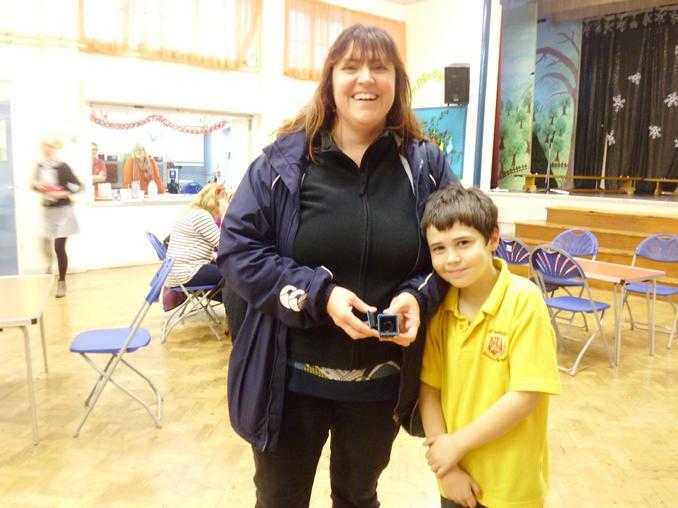 Tickets will be drawn at the Fairtrade afternoon on Thursday 3rd March. 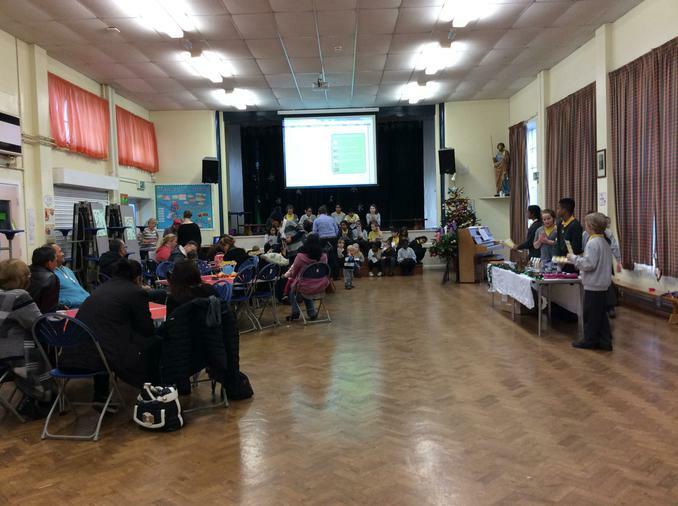 This will be a fairtrade 'breakfast' with speakers from Starbucks, with coffees and fairtrade snacks to eat. 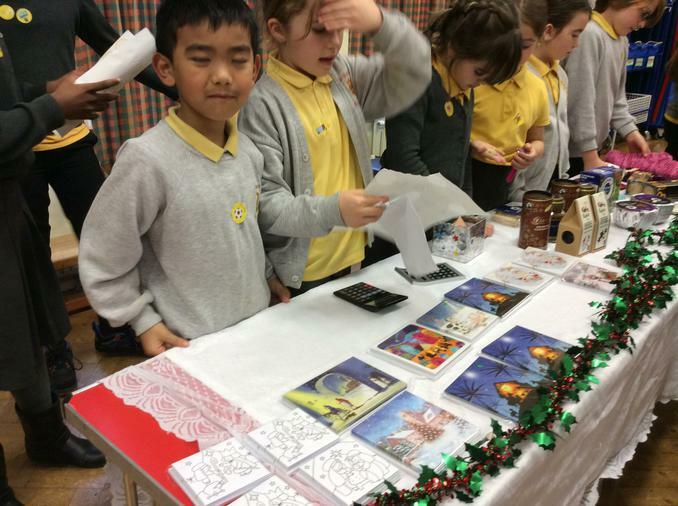 Fairtrade Christmas Fair 11.12.15 We made £100! 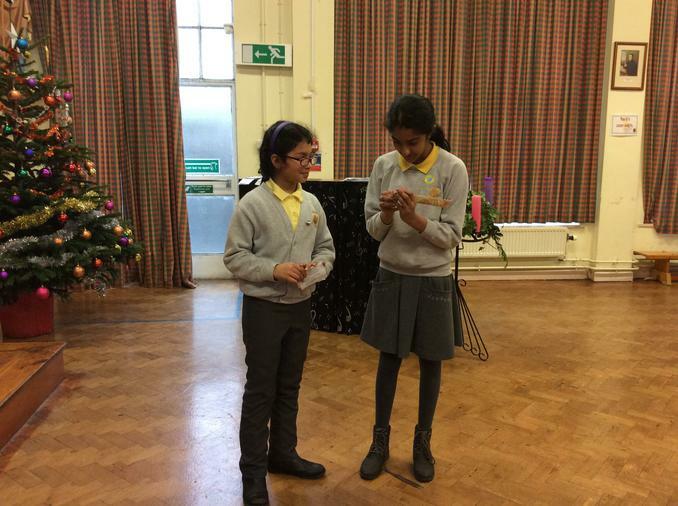 Hi, my name is Esme and I am in Year 6. 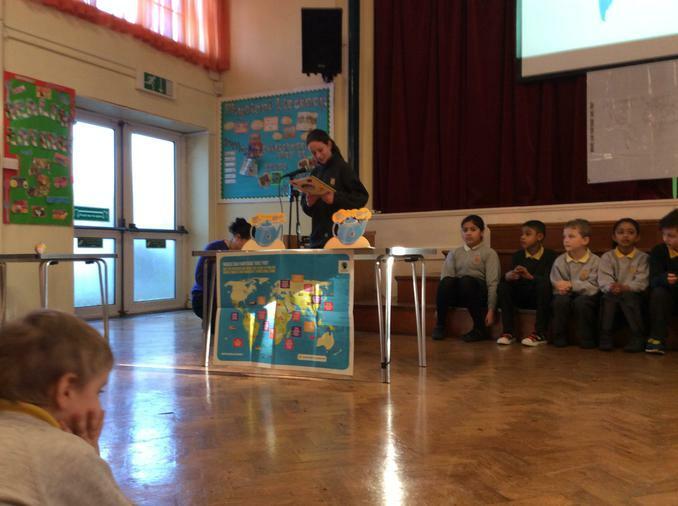 I am the chair of the Fairtrade Committee. 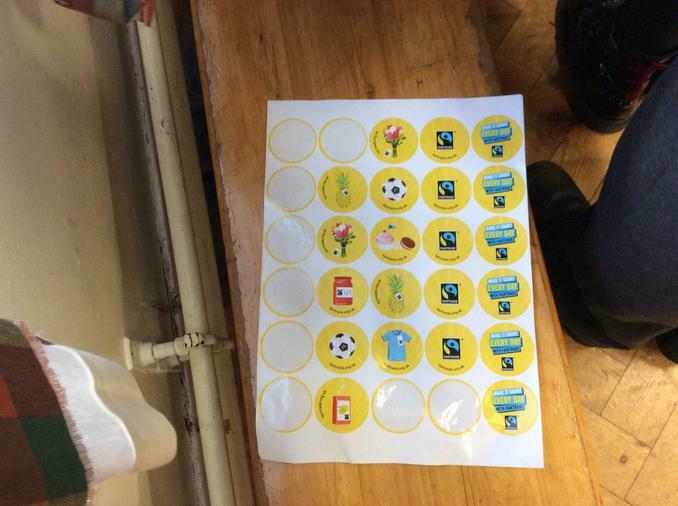 Along with Mrs Tuff, I ask questions and talk to the other Fairtrade members about targets we must achieve. 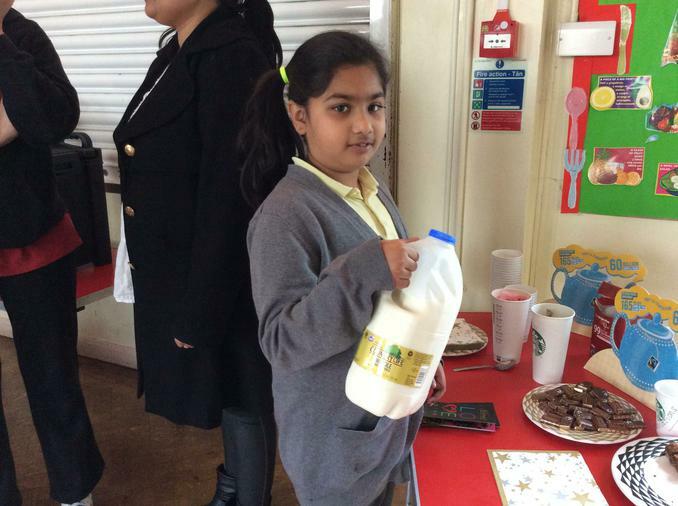 We must aim for fair pay schemes for farmers around the world who are in need. 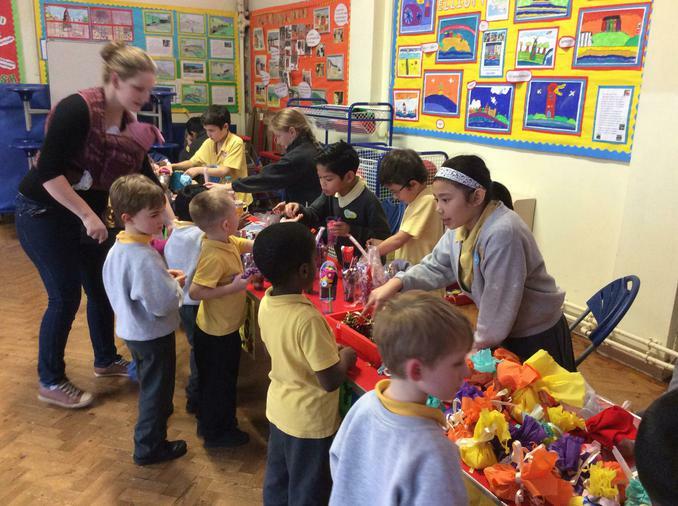 The only way we can make a good profit is with your help. 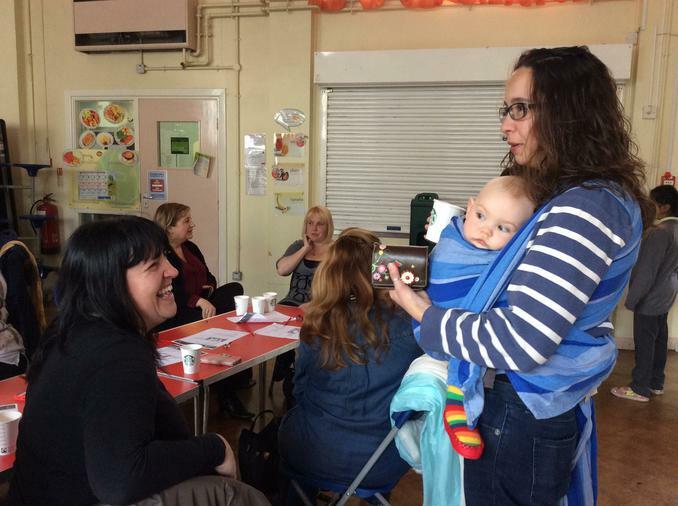 When we do different events we need your help with fundraising. 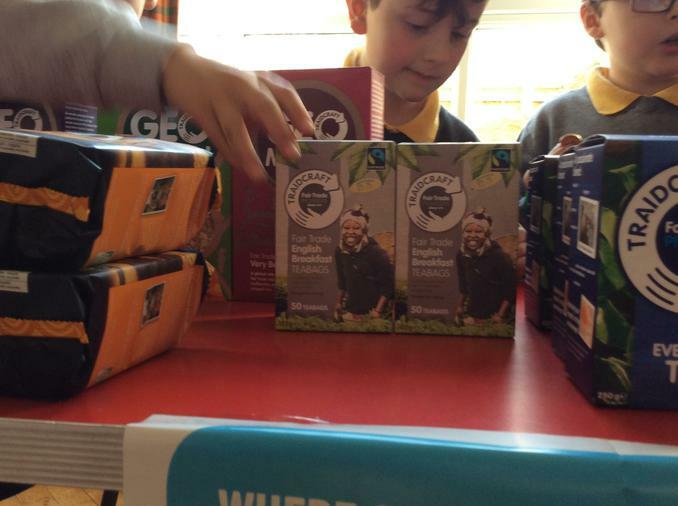 You can also by products with the Fairtrade icon on them. 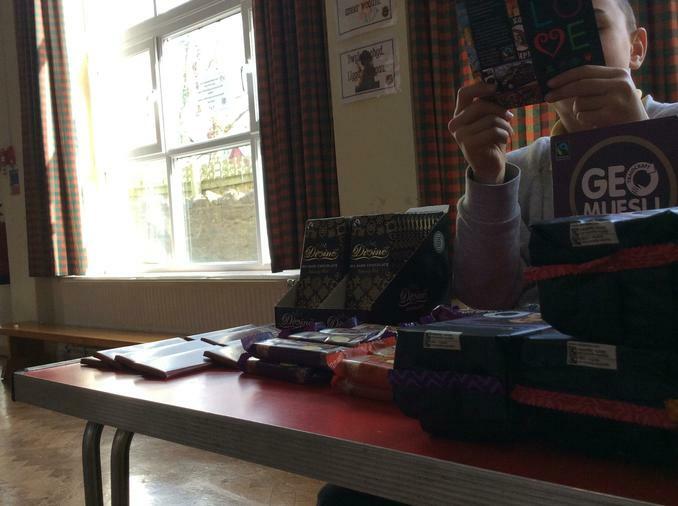 I hope you all enjoy me being your Fairtrade chair. Thank you. Esme. 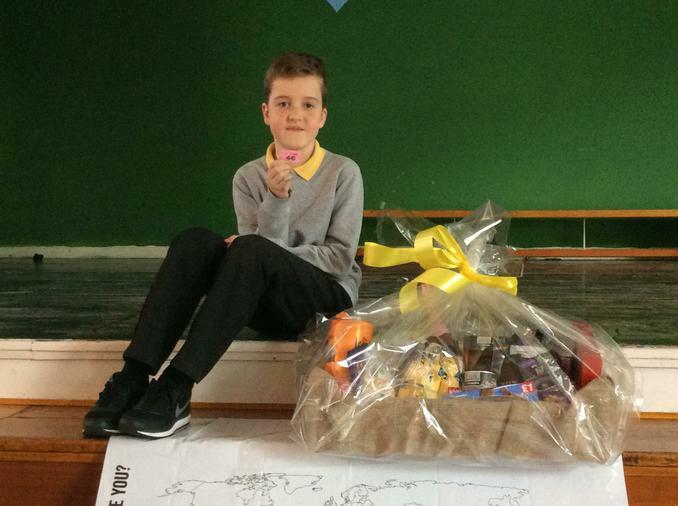 My name is Kane and I am the Year 6 representative. I am 10 years old. 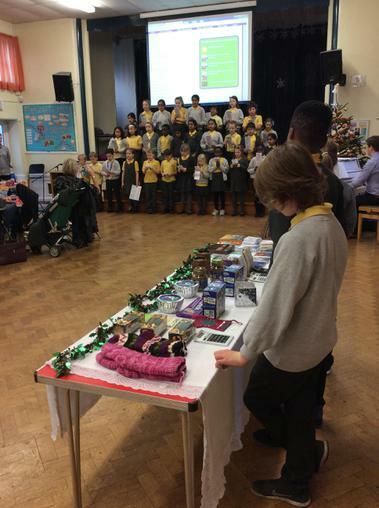 I am the Fairtrade secretary, my job is to take notes in our meetings (which I have to organise) and sort out when we will do the Christmas fair and what we will have at the fair. I have to help prepare the agenda for everyone. 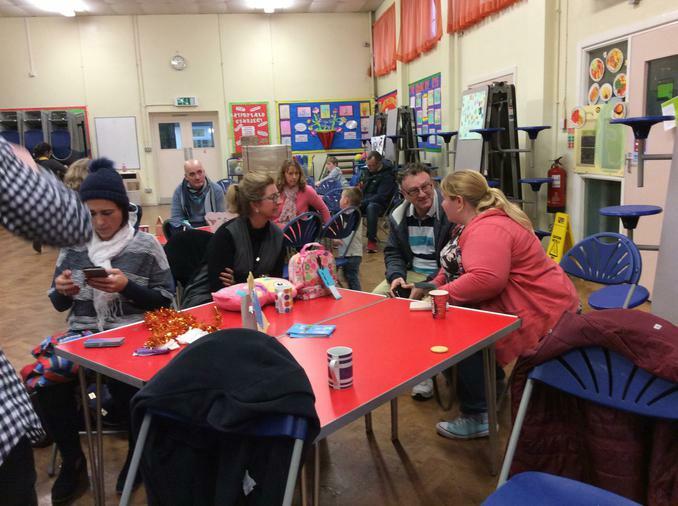 I have to let everyone know when we will be having our meeting and where we will be having them. 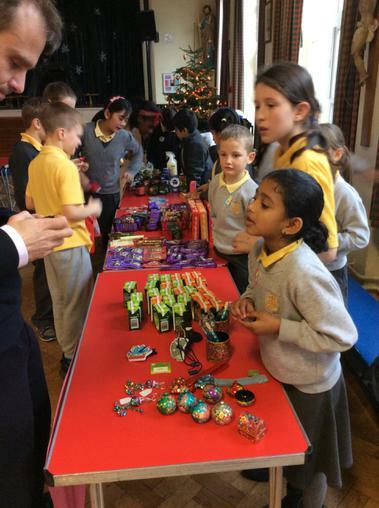 In events such as the Christmas fair, we get items from a Fairtrade shop called Fair-do's and we sell the items for the shop. 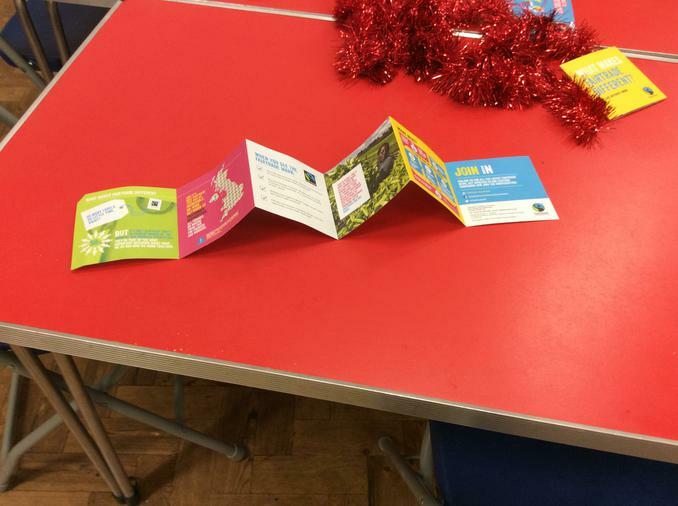 I also have to give out letters for assemblies and events. 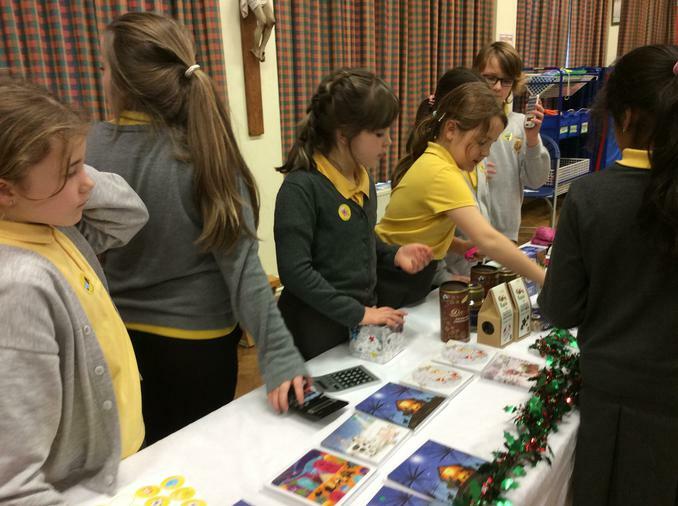 Our Fairtrade Christmas Sale was a great success. 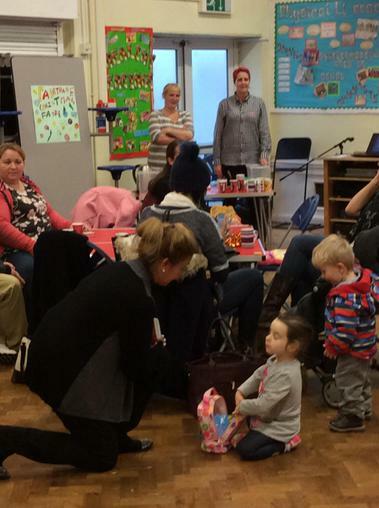 We are pleased to announce that we raised £334. 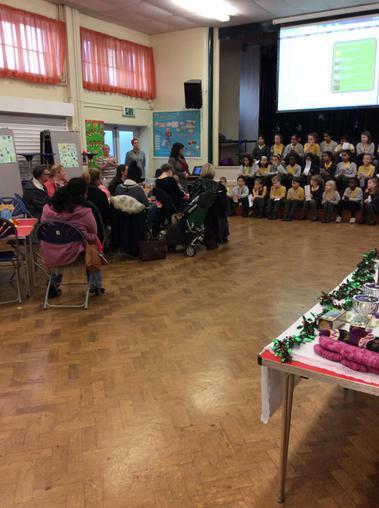 A big thank you to all the children and parents who supported the event. 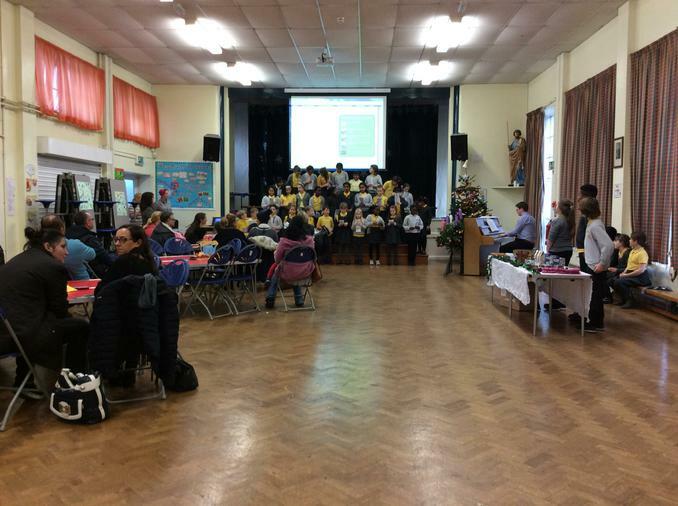 will take place on Thursday 18th December in the school hall. 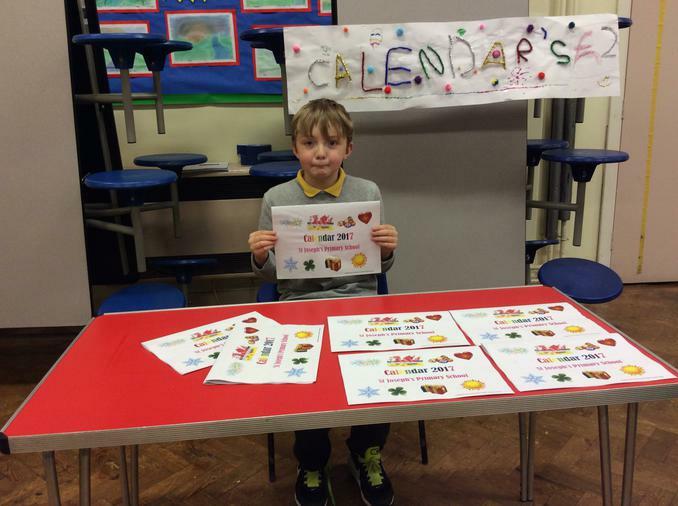 We decided as a group that we needed to make posters to advertise the sale. 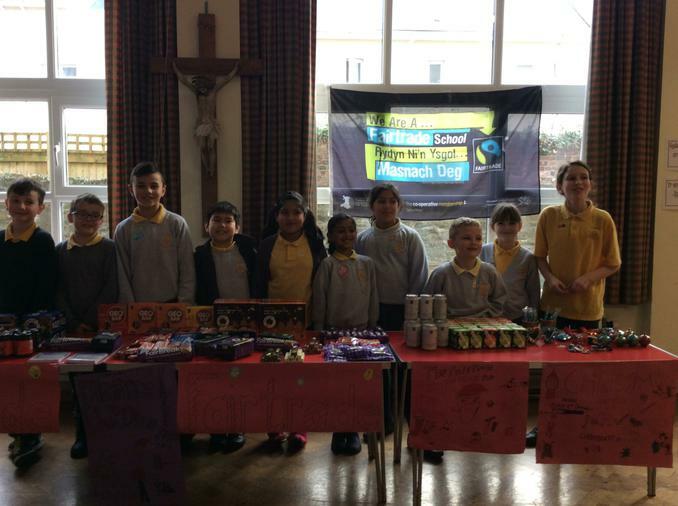 St Joseph’s Primary School has gained Fairtrade Status. 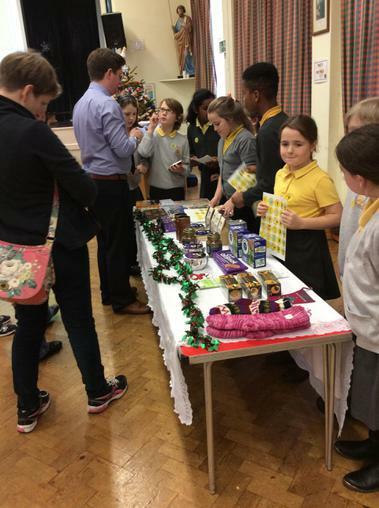 This means that both pupils and teachers hear about and are actively involved in the learning, awareness and promotion of Fairtrade. 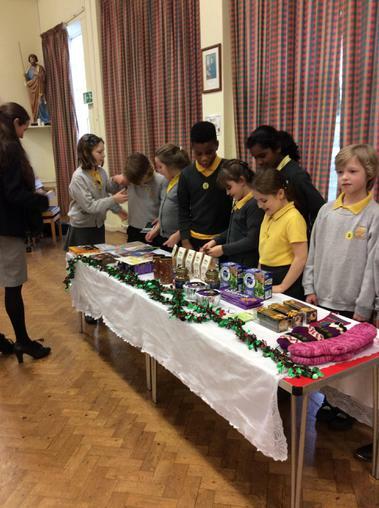 Our Fairtrade representatives are a very important part of this. 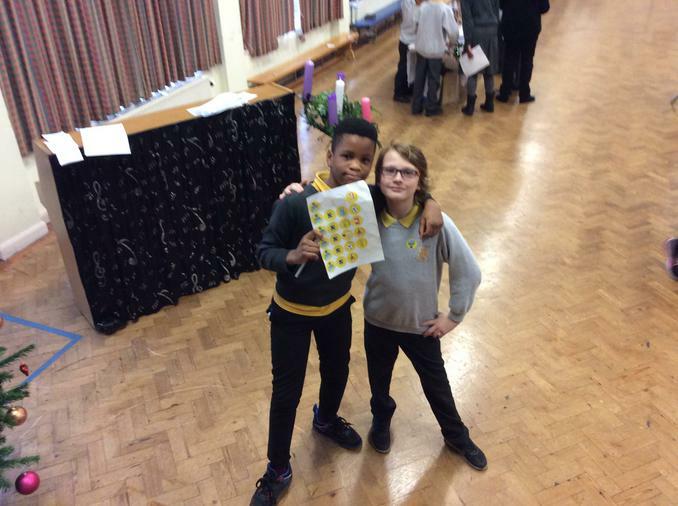 They are chosen from Years 2 to year 6 and elected by the pupils in the school. 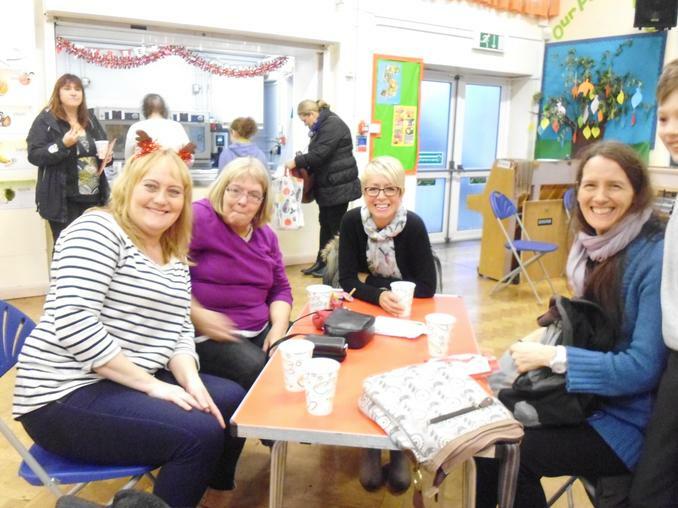 The committee meet once a week. 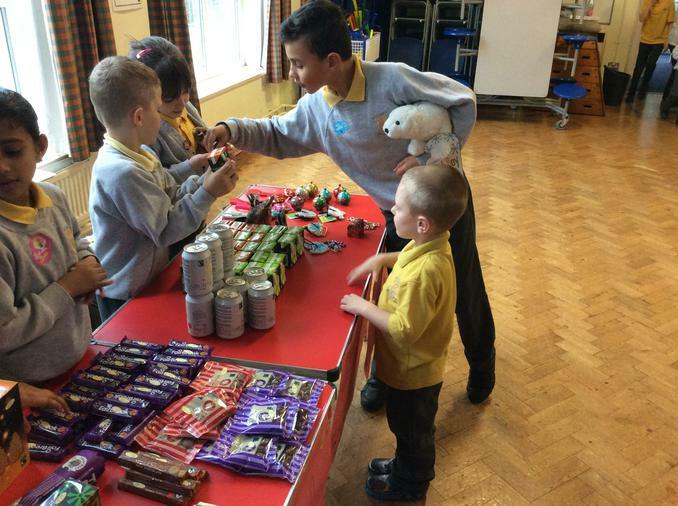 It is the Fairtrade representatives who drive all the Fairtrade activities in school, suggesting ideas and leading assemblies. 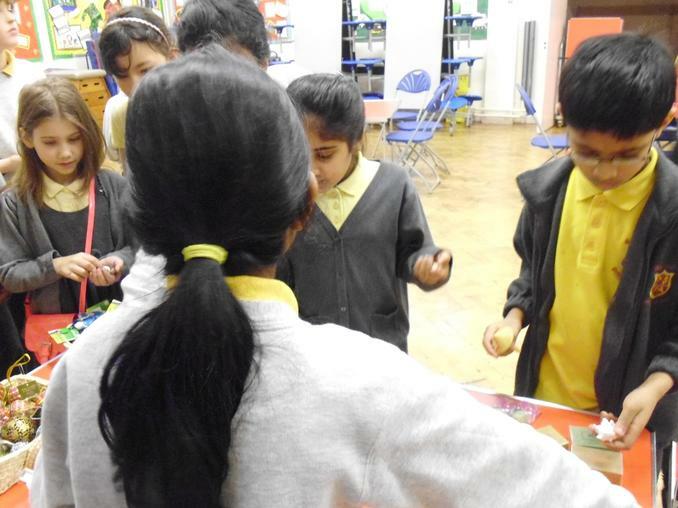 They ask for ideas for events from the rest of the school which they then discuss and organise. 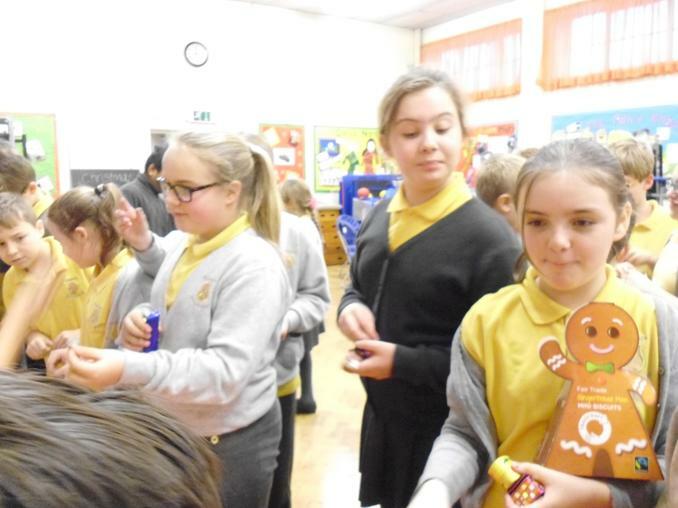 The aim is for 100% pupil awareness of what Fairtrade is and why it’s important. 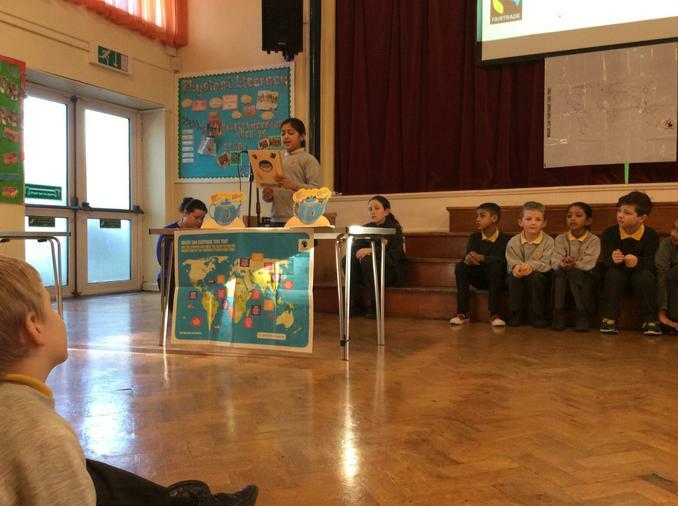 Pupils know they are part of something that is happening all over the country and around the world-and it’s great fun too! 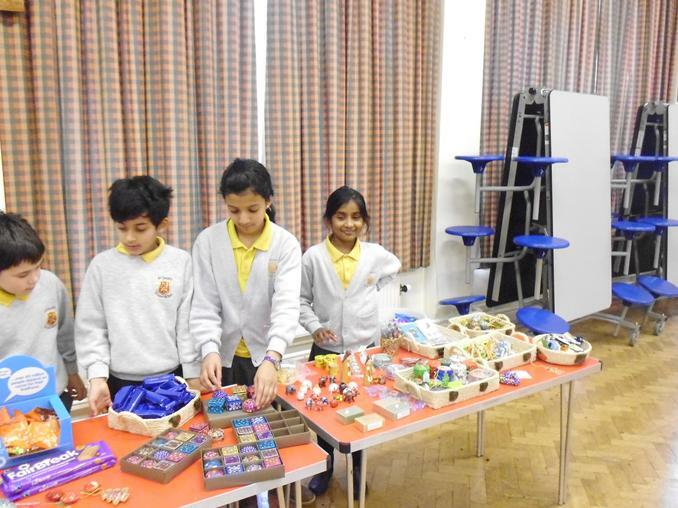 News from members of the Fairtrade Committee. 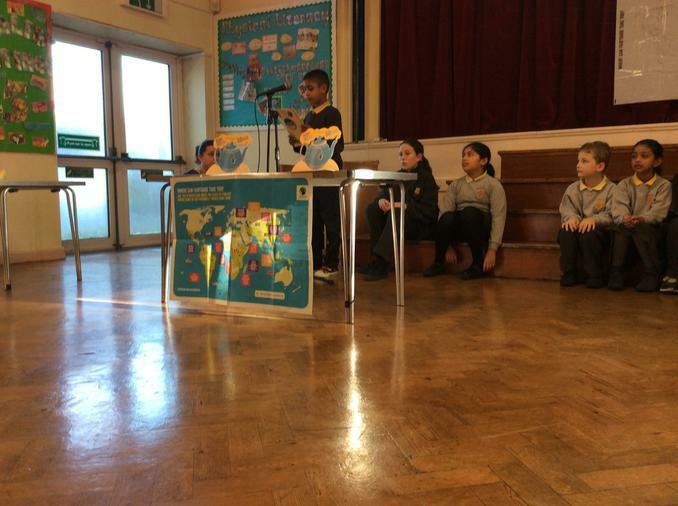 My name is John I am in year 6 and I’m the Chair of the Committee. 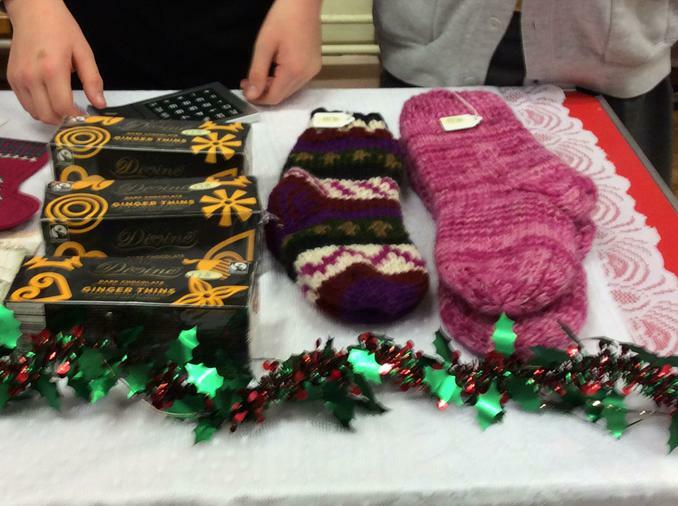 I have a very special job on the committee. 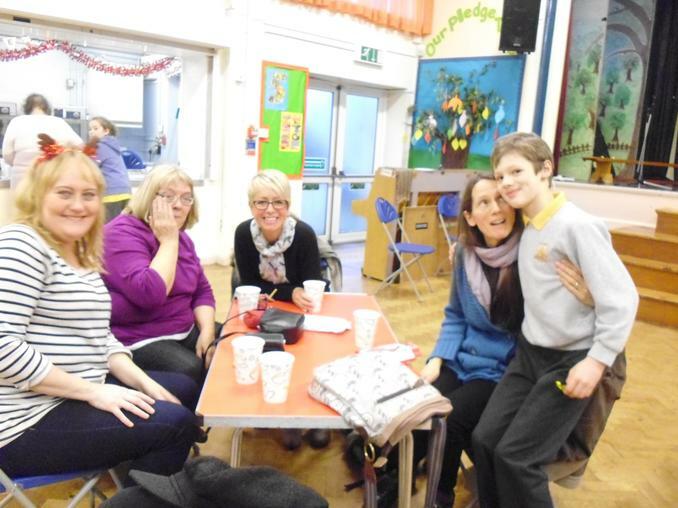 I have to try and run the meeting with help from Mrs Wells. 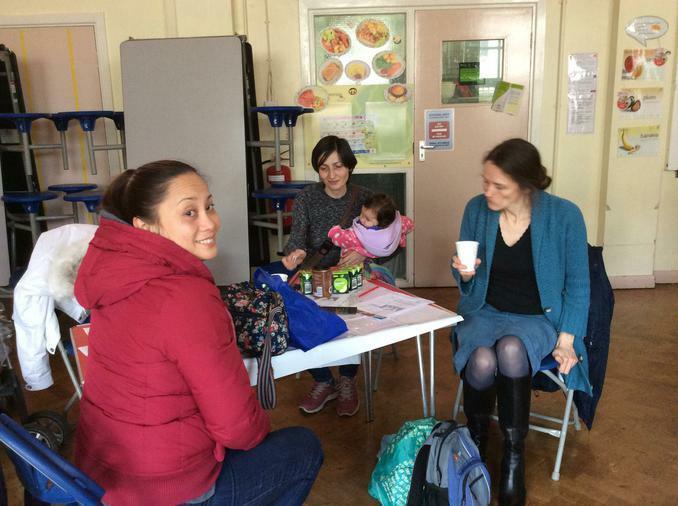 I help prepare the agenda and make sure that everyone is involved. 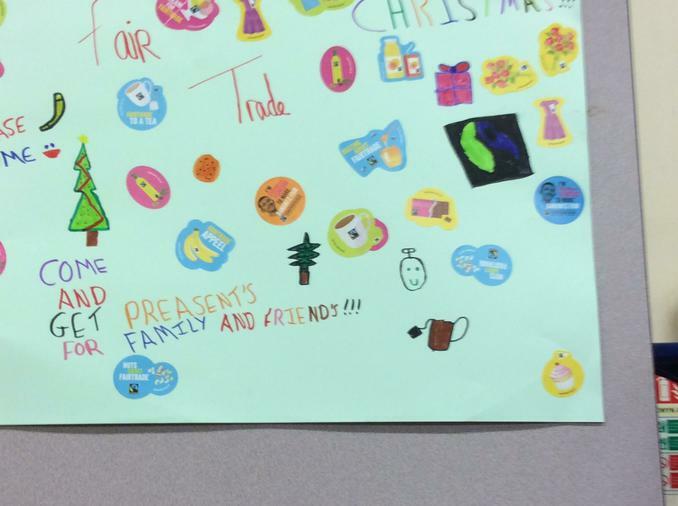 Framers and producers need to prove that their things are done correctly so they deserve the Fairtrade mark. 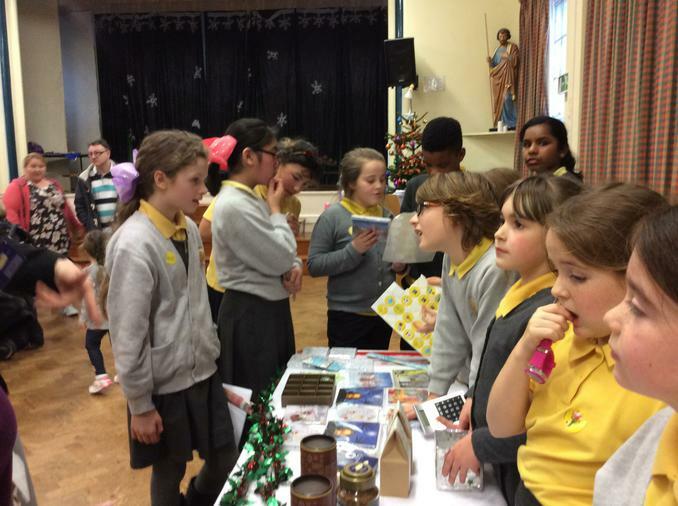 People who work for Fairtrade groups get fair pay schemes which help local people like helping schools get clean water and health care. 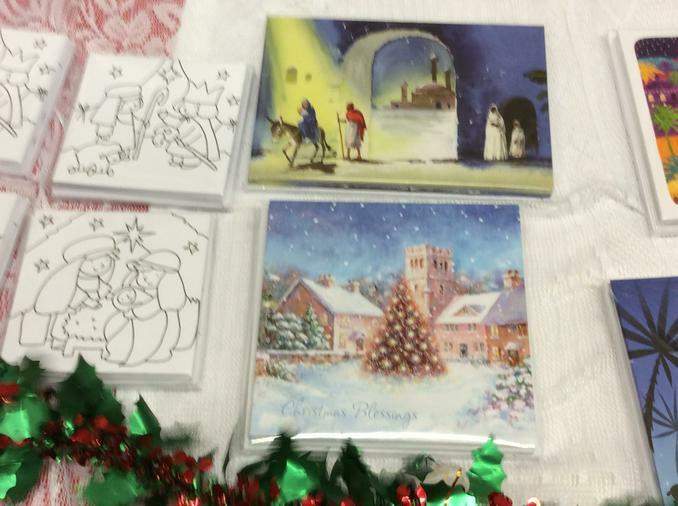 On Thursday 18th December at 2.30 pm we will be holding a Christmas Sale in the school hall. 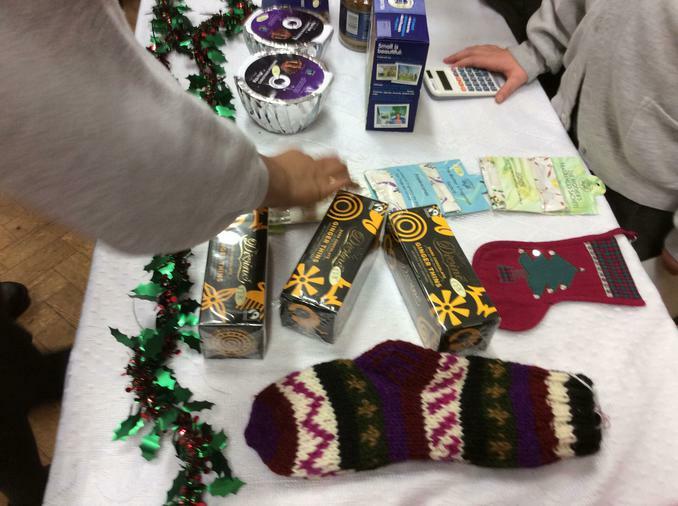 It will be a good opportunity to buy those last minute Christmas presents and at the same time treat yourself to a Fairtrade cup of tea and cake. 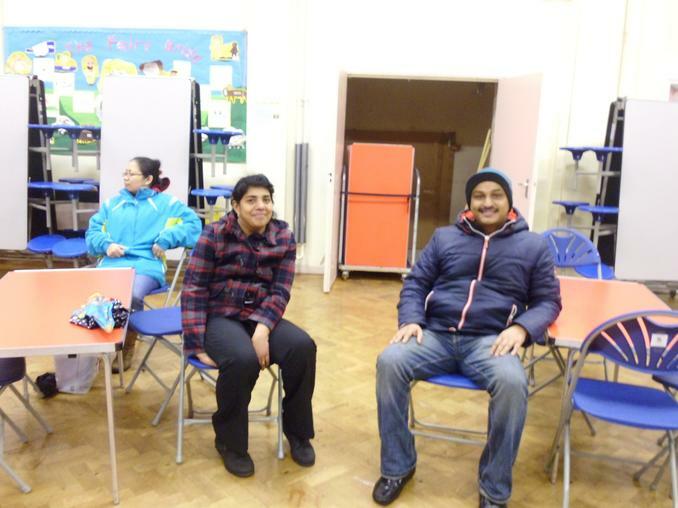 We hope that you will be able to come along and support us.